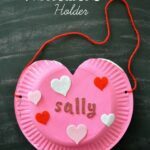 My daughter has loved the stamping activities we have done in the last couple months so I have been looking forward to trying out toilet paper roll heart printing for Valentine’s Day. 1. 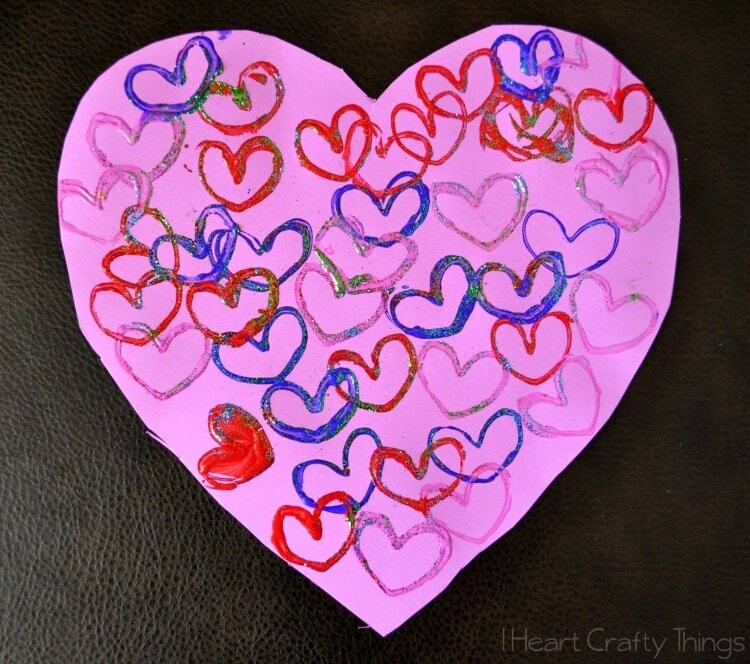 Cut a large pink heart out of a 12″ x 12″ sheet of cardstock paper for your canvas. 2. 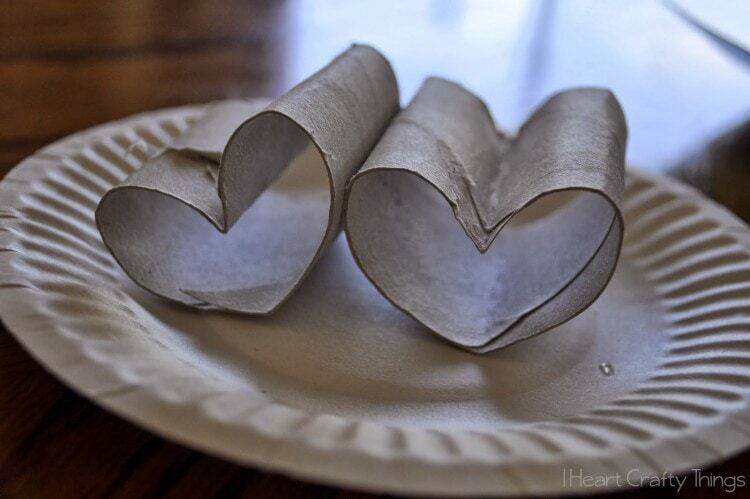 Bend your cardboard rolls into heart shapes (see picture below). 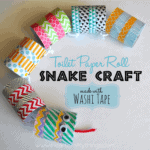 I ended up cutting my toilet paper rolls in half before forming them just to get more use out of each toilet paper roll. 3. 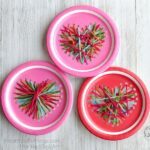 We always set up our stamping with our paints on small paper plates like pictured below. 4. 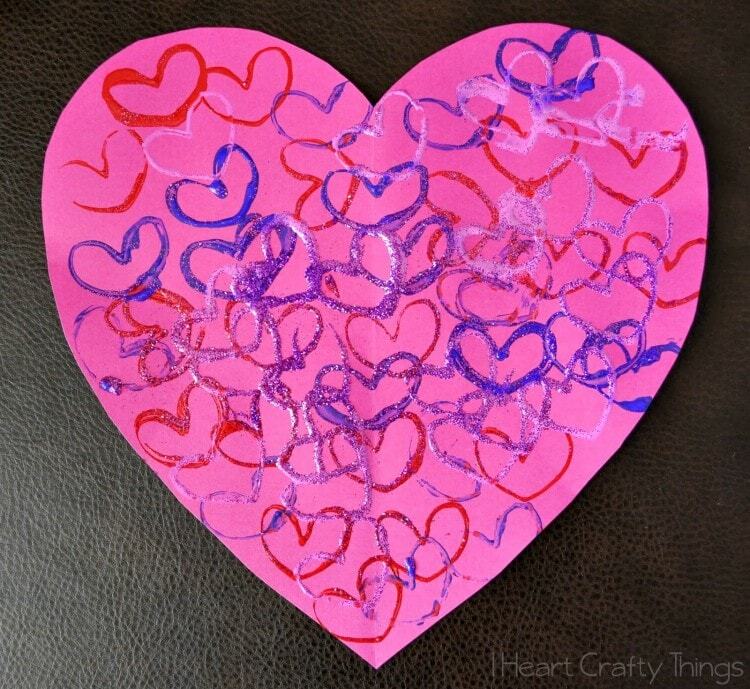 Use the stamps to print as many hearts as you want all over the heart canvas. 5. While the paint is still wet, sprinkle glitter all over your hearts to make them sparkle. 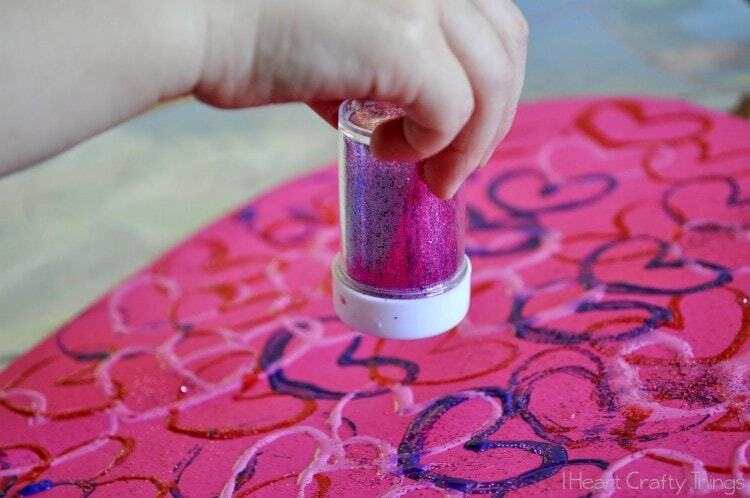 Pour the excess glitter in the garbage and let your artwork dry completely. Both my 6-year old and my 3-year old did this project. I forgot to mention that my 6-year old cut out his own heart for his project after I traced it for him.. Here is his artwork below. He chose to sprinkle blue, green and orange glitter all over his hearts. I love the contrast of the glitter on the hearts. You can see in the top picture of this post how in the sunshine it looks so shimmery. 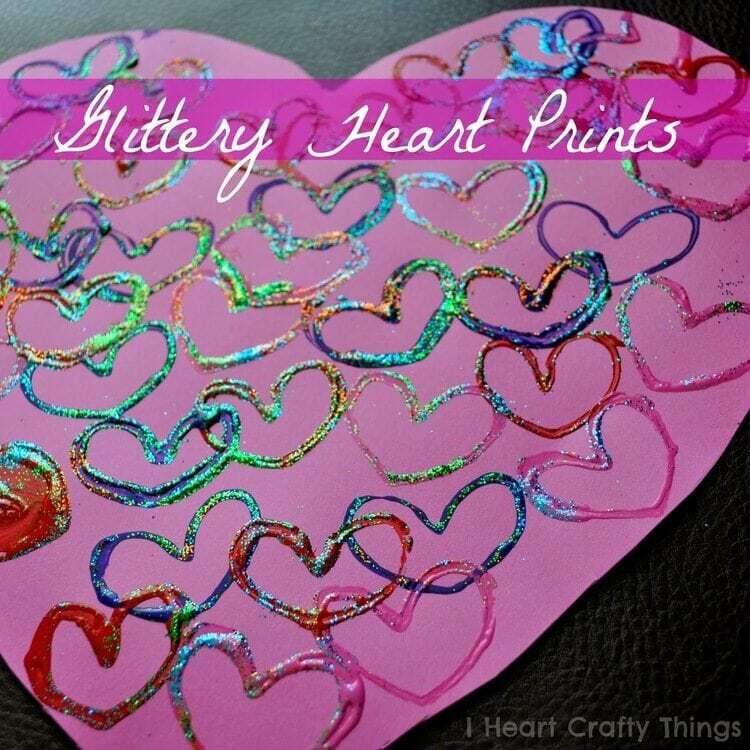 My daughter choose her favorite colors of purple and pink glitter on her heart prints. I love how several of her hearts got pretty concentrated with glitter and others not so much, giving the artwork lots of different texture. 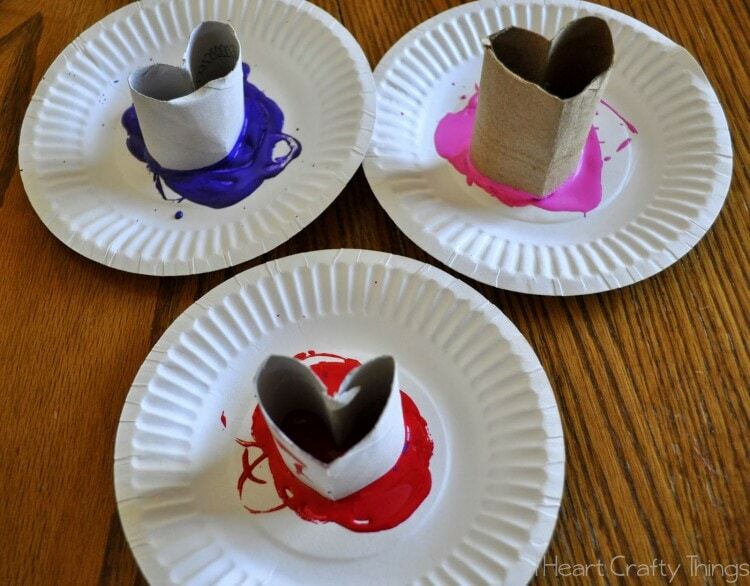 This is a simple activity that creates such a nice piece of artwork to display in your home for Valentine’s Day. 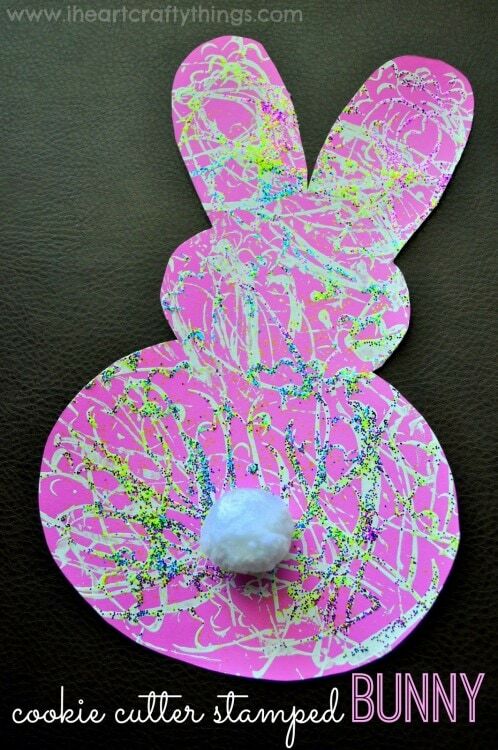 You might also enjoy our Bunny Stamped Craft! 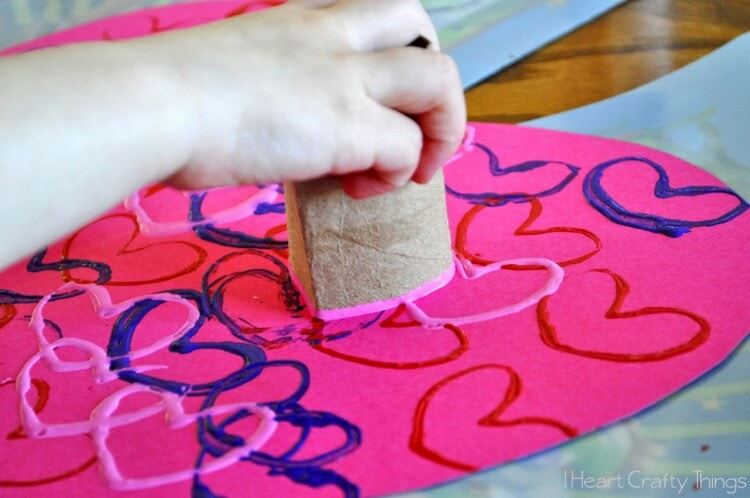 I love this easy preschool stamping craft. Can't wait to try it with my boys. Thank you. Pinning! !